See the great views under the oceans surface in this one-tank afternoon dive off of the coast of Paradise Island and Nassau, Bahamas. Our company has more than 40 years of experience in the diving business, and we know the best spots to dive. 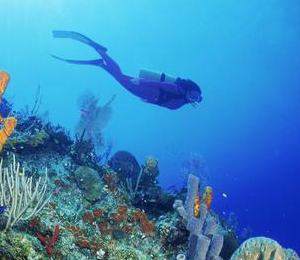 We take you to sites of underwater movie sets and sunken ships and the most colorful reefs in the Caribbean. Your small diving group could venture any number of interesting underwater sites, including the most popular underwater site for filming. Thunderball Reef has been the setting for several James Bond movies. It is known for its Staghorn and Elkhorn corals. Staghorn coral is a fast-growing branching, cylindrical coral. The Elkhorn coral has long leaf-like branches. These corals are believed to be among the most important corals of the Caribbean underwater ecosystem because of their contributions to reef growth and fishery habitat. Another favorite dive site is the LCT barge, a World War II troop carrier and landing craft that sank in 1945. For years, the local dive shops have been feeding the marine life around the barge, and as a result, the fish will eat right out of your hands. This site attracts the beautiful green and blue parrotfish and the vibrant colored angelfish, as well as the spotted eagle ray and the sleek stingray. Cannonball Reef is another popular site among the film industry. This coral garden attracts all kinds of marine life, including the yellowtail snapper, known for its accents of yellow lines along its body, and the brightly colored squirrelfish with its orange-tipped dorsal fin. Angelfish Reef is aptly named for its schools of French, grey, and queen angelfish. No matter where you dive, the clarity of the Caribbean water will give you fantastic views, so dont forget your underwater camera. Do you have nitrox tanks available? I have been to the Bahamas many times, but Bahama Divers One Tank Afternoon Dive is one of my favorite trips! It includes everything that everyone should do here. As a Bahamas veteran, I can say only the best about this experience!